一种光伏电池可以包括与半导体层接触的界面层。 A photovoltaic cell may include an interface layer in contact with the semiconductor layer. 本申请要求于2007年9月25日提交的第60/974，971号临时美国专利申请的优先权，该申请通过引用被包含于此。  This application claims priority No. 60 / 974,971 provisional US patent application on September 25, 2007 filed, the application is incorporated herein by reference. 本发明涉及光伏器件。  The present invention relates to a photovoltaic device. 通常，光伏器件可以由这样的材料组成，所述材料在界面处的性质与所述材料在其它位置的性质不同。  Generally, the photovoltaic device may be made of such a material, the material with the material properties at the interface of the different nature of the other positions. 界面是指自由表面或晶界附近的区域以及两种不同材料之间的区域。 It refers to the interface between the region at or near the free surface and the grain boundary regions of two different materials. 具体地讲，材料在界面处的电学性质会受到捕获电荷、偶极层和相互扩散的影响。 In particular, the electrical properties of the material will be at the interface trapped charge, dipole layer and influence of mutual diffusion. 材料在界面处的性质也会受到定域能级（localized energy level)(即，存在于有限空间(limited space)(与能带相反）中的能级）的影响。 Material properties at the interface will also be localized level (localized energy level) (i.e., present in a limited space (limited space) (the contrast level of the band)) is affected. 定域能级通常与界面处的杂质、本征缺陷或者结晶缺陷有夫。 Generally localized level of impurities at the interface, the intrinsic defects or crystal defects married. 一种光伏器件可以包括：透明导电层，位于基底上；第一半导体层，包括宽带隙半导体；第二半导体层，具有表面；界面层，与第二半导体层接触，其中，所述界面层将第二半导体层的化学势保持在受控级。  A photovoltaic device may comprise: a transparent conductive layer on a substrate; a first semiconductor layer, comprising a wide bandgap semiconductor; a second semiconductor layer having a surface; interface layer in contact with the second semiconductor layer, wherein said the interface layer is the chemical potential of the second semiconductor layer is maintained at a controlled level. 第二半导体层可以包括CdTe。  The second semiconductor layer may include CdTe. 第二半导体层可以包括CdTe的合金。 The second semiconductor layer may include an alloy of CdTe. 第二半导体层可以包括CMTe合金,其中，CM至少部分地被Zn、Hg、Mg或Mn代替。 The second semiconductor layer may include an alloy CMTe, wherein, the CM at least partially Zn, Hg, Mg, or Mn instead. 第二半导体层可以包括CdTe合金，其中，Te至少部分地被S、Se或0代替。 The second semiconductor layer may include an alloy CdTe, wherein, Te at least partially S, Se or 0 instead. 所述光伏器件可以具有保持Cd的化学势的界面层。  The photovoltaic device may have a chemical potential holding Cd interface layer. 所述器件可以具有在所述半导体的与第二半导体的界面接近的区域内受控的所述化学势。 The device may have controlled the chemical potential in the second semiconductor region close to the interface of the semiconductor. 所述界面层可以位于第二半导体层和背面电极之间。 The interfacial layer may be positioned between the second semiconductor layer and the back electrode. 所述界面层可以为第三半导体层。 The interfacial layer may be a third semiconductor layer. 所述光伏器件可以具有半导体材料，所述半导体材料包括ZnTe、CdZnTe, CuAlS2,CuAlSe2、CuA102、CuGaO2 或CuInO2。  The photovoltaic device may have a semiconductor material, the semiconductor material comprises a ZnTe, CdZnTe, CuAlS2, CuAlSe2, CuA102, CuGaO2 or CuInO2. 界面材料可以包括GeTe、CdTe: P、CdTe: N、NiAs 或NbP。 Interface material may include GeTe, CdTe: P, CdTe: N, NiAs or NbP. 半导体层例如CdTe层可以具有表面。  The semiconductor layer may have a surface layer e.g. CdTe. 所述表面可以包括Cd与周期表第五主族的元素之间的化学键。 The surface may comprise a chemical bond between elements Cd and fifth main group of the Periodic Table. 所述表面可以包括Cd与N、P、As和Sb之间的化学键。 The surface may include a bond between Cd, N, P, As and Sb. 所述界面层可以位于第二半导体层和第一半导体层之间。 The interfacial layer may be positioned between the second semiconductor layer and the first semiconductor layer. 第一半导体层可以包括 Sn02、SnO2: Zn、SnO2: Cd、ZnO、ZnSe、GaN、In2O3, CdSnO3, ZnS或CdZnS。  The first semiconductor layer may include Sn02, SnO2: Zn, SnO2: Cd, ZnO, ZnSe, GaN, In2O3, CdSnO3, ZnS or CdZnS. 所述界面层可以是Cd与包含0、S或Se的硫族元素中的任何ー种的化合物。 The interfacial layer may be Cd comprising 0, S or any compound thereof ー chalcogen element in Se. 所述界面层可以包括WS。 The interfacial layer may comprise WS. 所述器件可以包括具有表面的半导体，所述表面包括在Te与周期表第三主族中的任何元素之间的化学键。  The device may include a semiconductor having a surface, said surface comprising a chemical bond between any element in the periodic table, Te and the third main group. 所述器件可以包括具有表面的半导体，所述表面包括Te与B、Al、Ga、In或Tl之间的化学键。 The device may include a semiconductor having a surface, said surface comprising a chemical bond between Te and B, Al, Ga, In or Tl. 在一些情况下，所述界面层可以是具有化学式ABO2的材料或者它们的掺杂组合物中的一种，其中，A 是Cu、Ag、Au、Pt 或Pd, B 是三价金属离子Al、In、Cr、Co、Fe、Ga、Ti、Co、Ni、Cs、Rh、Sn、Y、La、Pr、Nd、Sm或Eu。  In some cases, the interface layer may be a material having the formula or one of ABO2 dopant composition thereof, wherein, A is Cu, Ag, Au, Pt or Pd, B is a trivalent metal ions Al, In, Cr, Co, Fe, Ga, Ti, Co, Ni, Cs, Rh, Sn, Y, La, Pr, Nd, Sm or Eu. 在其它情况下，第二半导体层可以小于2 ym厚。 In other cases, the second semiconductor layer may be less than 2 ym thick. 在其它情况下，第二半导体层可以小于I Pm厚。 In other cases, the second semiconductor layer may be less than I Pm thick. 所述器件可以包括位于透明导电层和第一半导体层之间的另一界面层。 The device may further comprise an interfacial layer located between the transparent conductive layer and the first semiconductor layer. 一种制造光伏器件的方法可以包括以下步骤：在基底上沉积第一半导体层，第一半导体层包括宽带隙半导体；在第一半导体层上方沉积第二半导体层；沉积界面层，以与第二半导体层接触，其中，界面层将第二半导体层的化学势保持在受控级。  A method of manufacturing a photovoltaic device may comprise the steps of: depositing a first semiconductor layer on a substrate, a first semiconductor layer comprises a wide bandgap semiconductor; a second semiconductor layer deposited over the first semiconductor layer; depositing a interfacial layer to contact with the second semiconductor layer, wherein the interfacial layer is the chemical potential of the second semiconductor layer is maintained at a controlled level. 在一些情况下，可以通过溅射来沉积所述界面层。  In some cases, the interface layer may be deposited by sputtering. 可以通过原子层沉积来沉积所述界面层。 The interfacial layer may be deposited by atomic layer deposition. 可以通过选择性离子层吸收和反应沉积来沉积所述界面层。 Depositing the interfacial layer and can absorb the reaction layer is deposited by selective ion. 一种用于产生电能的系统可以包括：透明导电层，位于基底上；第一半导体层，包括宽带隙半导体；第二半导体层；界面层，与第二半导体层接触，其中，所述界面层将第二半导体层的化学势保持在受控级；第一电连接，连接到所述透明导电层；第二电连接，连接到背面金属接触。 System  A method for generating electrical energy may comprise: a transparent conductive layer on a substrate; a first semiconductor layer, comprising a wide bandgap semiconductor; a second semiconductor layer; interface layer in contact with the second semiconductor layer, wherein the said interface layer chemical potential of the second semiconductor layer is maintained at a controlled level; a first electrical connector connected to the transparent conductive layer; a second connector electrically connected to the back metal contact. 在一些情况下，可以用金属电极来代替所述透明导电层，可以用透明导电层电极来代替金属背面电极。  In some cases, the metal electrode may be used instead of the transparent conductive layer, a transparent conductive layer of the electrode may be used instead of the metal back electrode. 在其它情况下，系统还可以包括连接到所述透明导电层的第一电极和连接到所述背面金属接触的第二电极。 In other cases, the system may further comprise a first electrode and a second electrode connected to the rear metal contact is connected to the transparent conductive layer. 在其它情况下，可以用所述透明导电层来代替所述背面金属电极，所述器件可以与另一个光伏器件串联（tandem)使用。 In other cases, the transparent conductive layer may be used in place of the metallic back electrode, the photovoltaic device may be connected in series with another device (Tandem) use. 在附图和后面的描述中提到了一个或多个实施例的细节。  The mentioned one or more of the details of the embodiments in the accompanying drawings and the following description. 其它特征、目的和优点将通过说明书和附图以及权利要求而变得清楚。 Other features, objects, and advantages will become apparent from the description and drawings, and from the claims. 图I是具有多个层的光伏器件的示意图。  FIG. I is a schematic of a photovoltaic device having a plurality of layers. 图2是用于产生电能的系统的示意图。  FIG. 2 is a schematic of a system for generating electrical energy. 图3是具有多个层的光伏器件的示意图。  FIG. 3 is a schematic of a photovoltaic device having a plurality of layers. 图4是具有多个层的光伏器件的示意图。  FIG. 4 is a schematic of a photovoltaic device having a plurality of layers. 图5A是具有多个层的光伏器件的示意图。  FIG 5A is a schematic of a photovoltaic device having a plurality of layers. 图5B是具有多个层的光伏器件的示意图。  FIG 5B is a schematic of a photovoltaic device having a plurality of layers. 图5C是具有多个层的光伏器件的示意图。  FIG 5C is a schematic of a photovoltaic device having a plurality of layers. 通常，光伏器件可以包括第一半导体层、第二半导体层和与第二半导体层接触的界面层，其中，第一半导体层包括宽带隙的半导体，界面层将第二半导体层的化学势保持在受控级（controlled level)。  Generally, the photovoltaic device may include a first semiconductor layer, a second semiconductor layer and the interface layer in contact with the second semiconductor layer, wherein the first semiconductor layer comprises a semiconductor layer of a second chemical wide bandgap semiconductor, the interfacial layer potential maintained at a controlled level (controlled level). 受控级表示在照明和偏置条件下界面处和界面附近的区域内的稳态化学势，从而优化器件性能。 Controlled and steady-state level represents the chemical potential at the interface in the vicinity of the interface region under illumination and bias conditions, to optimize device performance. 通过单独钝化晶界并不能实现受控级的化学势。 Grain boundary by a separate passivation stage, and not a controlled chemical potential. 然而，本领域技术人员应该尽力清楚地预期到在界面附近的区域内改变的化学势对本征缺陷的影响。 However, those skilled in the art should try to influence clearly anticipated changes in the region near the interface chemical potential of the intrinsic defects. 采用CdTe光伏器件，例如，缺陷形成能和相关的定域能级（存在于有限空间内的能级）的特征为这些缺陷的化学势。  The CdTe photovoltaic devices, e.g., energy and chemical potential defect formation associated localized level characteristics (the level present in the limited space) for these defects. 缺陷的说明包括缺陷的电荷状态，即，匕ドふ。 DESCRIPTION defects include a defect state of charge, i.e., dagger ド fu. 两种缺陷通过化学反应匕O 而被联系起来。 Two kinds of defects are linked by a chemical reaction dagger O. 两种缺陷的原子结构和能级通常不同。 Atomic structure and energy level is typically different types of defects. 在这个示例中，各种缺陷的相对浓度通过质量作用定律控制。 In this example, the relative concentration of the various defects controlled by the mass action. Ved的浓度取决于Cd的化学势，电子的浓度取决于电子准费米能级。 Ved Cd concentration depends on the chemical potential, the concentration of electrons depends on the electron quasi-Fermi level. 器件内的准费米能级相应地取决于光照的強度和光谱含量、施加到器件的电压偏置以及器件内的缺陷类型和浓度。 Quasi-Fermi level in the device depends on the intensity and spectral content of light respectively, and a bias voltage is applied to the type and concentration of defects in the device of the device. 与所有化学反应ー样，缺陷化学反应的速率是温度的函数。ー like with all chemical reactions, the defect rate of the chemical reaction is a function of temperature. 在一些半导体材料中，在光伏阵列区域中存在的在各温度下的化学反应速率可足以产生缺陷浓度的变化，该缺陷浓度的变化相应地影响光伏器件的功率转换效率。 In some semiconductor material, the rate of the chemical reaction occurring in the region of the photovoltaic array at each temperature can be sufficient to produce a change in the concentration of defects, the defect concentration varies accordingly affect the power conversion efficiency of the photovoltaic device. 因此，重要的是设计光伏器件中的材料和界面，使得在被优化的区域中找到存在于光照和偏置的稳态条件下的相关缺陷化学，从而在区域中产生最大功率转换效率。 Thus, it is important in the design of a photovoltaic device and a material interface, such that the presence of chemical defects found in the related illumination conditions and under steady-state offset in the region is optimized, thereby generating the maximum power conversion efficiency in the region. 采用CdTe光伏器件，认为大多数相关缺陷化学与Cd子晶格有夫。  The CdTe photovoltaic devices, defect chemistry associated with that most Cd sublattice married. 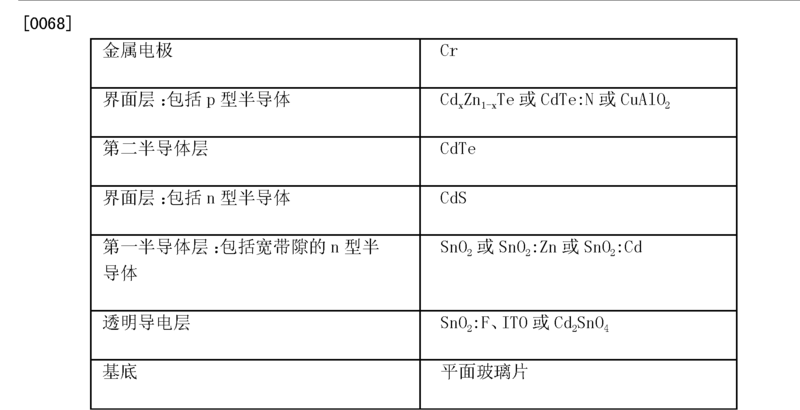 例如，对于弗伦克尔缺陷，化学反应是CゴCrf »Fctf+ O^。 For example, Frenkel defects, chemical reaction Oligo C Crf »Fctf + O ^. 镉原子位上的镉原子具有可逆反应，从而变成空的镉位加上处于间隙位的镉原子。 Cd Cd atom atoms bit reversible reaction to become empty bits plus Cd Cd atoms in the interstitial sites. 在表面（S)或者晶界（gb)附近，等效的反应变成Cdcd <=> Vcd +OZs或者Cda <=> Vcd+Cdgb。  grain boundaries (gb) or near the surface (S), an equivalent reaction became Cdcd <=> Vcd + OZs or Cda <=> Vcd + Cdgb. 镉间隙是施主，镉空位是受主。 Cadmium is a donor gap, cadmium vacancies is an acceptor. 如果处于晶界或者表面的Cd原子也是施主，则晶界和表面的特征将趋于偶极层或者n型晶界或者与p型子表面层相邻的表面。 If Cd atoms in the grain boundary or the surface of the donor is, grain boundary and surface features would tend dipole layer or the n-type and p-type grain boundaries or sub-surface layer adjacent to the surface. 光伏器件由几个层构成。  The photovoltaic device consists of several layers. 在一种结构中，半导体材料的多个层可以涂覆到基底，其中，一层作为窗ロ层，第二层作为吸收层。 In one configuration, a plurality of layers of semiconductor material may be applied to a substrate, wherein the layer as a window ro layer, the second layer as an absorbing layer. 光伏器件的ー个必要特征在于在两个层之间形成整流结（rectifying junction)。ー essential features of a photovoltaic device is to form a rectifying junction (rectifying junction) between the two layers. 在单结光伏器件的传统结构中，一种半导体利用带正电的空穴导电，因此被称为P型材料，另ー种半导体利用带负电的电子导电，因此称为n型材料，这两种半导体的结称为Pn结。 In a conventional single junction photovoltaic device structure, a hole-conducting semiconductor using a positively charged, it is called a P-type material, and the other using an electron conductive semiconductor ー negatively charged, and therefore referred to as n-type material, both Pn junction semiconductor junction is called. 整流结可以形成在包括例如pn、pp+、p_p、nn+和n_n的各种半导体材料之间。 It may include a rectifying junction formed between pn, pp +, p_p, various semiconductor materials such as nn + and in n_n. 主整流结位于两种半导体之间的光伏器件被称作“Pn器件”或者“单结”器件。 Main rectifying junction photovoltaic device is located between the two semiconductors is called "Pn device" or "throws" device. 当在半导体层中吸收能量大于半导体带隙的太阳光或者其它光学辐射时，光子转换为电子-空穴对。  When absorbed in the semiconductor layer is greater than the semiconductor band gap energy of sunlight or other optical radiation, photons into electron - hole pairs. P型半导体中的电子和n型半导体中的空穴被分类为“少数载流子”。 P-type semiconductor and n-type semiconductor in an electronic holes are classified as "minority carriers." 光产生的少数载流子在产生该少数载流子的半导体层内因扩散和漂移的驱动而运动，直到它们在产生该少数载流子的半导体内与相反类型的载流子复合或在产生该少数载流子的半导体的界面处复合，或者被另一半导体层收集。 Minority carrier light generated in the internal diffusion and drift of the driving semiconductor layer generates the minority carriers moved until they produce the opposite type of carrier recombination or generating the semiconductor of the minority carriers interface recombination of minority carriers in a semiconductor, or another semiconductor layer is collected. 复合是降低光伏器件中的光伏功率转换效率的损耗机制。 Compound is reduced in a photovoltaic device is a photovoltaic power conversion efficiency loss mechanisms. 在单结光伏器件的一种结构中，使用带隙相对宽的半导体作为半导体层中的一层。  In one structure of a single-junction photovoltaic devices, a relatively wide band gap semiconductor layer as a semiconductor layer. 使用带隙宽的半导体层有几个潜在的优点，这些优点包括这种半导体作为“窗ロ”层。 Using a wide band gap semiconductor layer has several potential advantages, which include such semiconductor as a "window ro" layer. 当使窗ロ层面对太阳时，窗ロ层可以允许太阳光辐射渗透到光子被转换为电子-空穴对的吸收层中。 When the level of the window when the sun ro, ro window layer can allow solar radiation to penetrate the photons are converted to electron - hole pairs in the absorption layer. 在光伏器件中，电子被n型材料收集，空穴被p型材料收集。 In the photovoltaic device, the electrons are collected by the n-type material, the holes are collected by p-type material. 通过整流结防止一旦载流子被收集则在相反方向上流动的电流，从而使电流通过外部电路。 Rectifying junction by preventing current flow is then collected in the opposite direction once the carriers, so that the current through the external circuit. 按照这种方式，光功率被转换为电功率。 In this manner, the optical power is converted into electric power. 要求保护的器件涉及减少电子-空穴复合的方法，其中，电子-空穴复合降低光伏器件的最大功率时的电流。 The device claimed relates to the reduction electron - hole recombination process, wherein the electron - hole recombination current at maximum power reduction of the photovoltaic device. 也会通过包括存在于光伏器件内的界面偶极子的空间电荷而降低最大功率的电压。 Also decreased by including a maximum power voltage within the space charge present in the interface dipole photovoltaic device. 要求保护的器件減少了使光伏器件中的最大功率电压下降的空间电荷。 It claimed that the device reduces the maximum power of photovoltaic device voltage drop in the space charge. 所以，要求保护的器件通过采用下面将更充分描述的各种界面层来提高光伏器件的功率转换效率。 Therefore, the claimed device to improve power conversion efficiency of the photovoltaic device by employing various interface layers described more fully below. 一些光伏器件可以采用也是电荷的导体的透明薄膜。  Some of the photovoltaic device is also a transparent conductive film may be employed in the charge. 导电薄膜可以是包含透明导电氧化物（TCO)，例如，掺氟的氧化锡、掺铝的氧化锌或者氧化铟锡的透明导电层。 The conductive film may be a transparent conductive oxide (the TCO), e.g., fluorine doped tin oxide transparent conductive layer is indium tin oxide or zinc oxide doped with aluminum. TCO可以允许光穿过半导体窗ロ到达活性光吸收材料并且还作为欧姆电极，从而将光产生的带电载流子运送为远离光吸收材料。 TCO window may allow light to pass ro reach the active semiconductor light absorbing material and also as an ohmic electrode, so that the light generated charge carriers transported away from the light absorbing material. 另外，可以在半导体层的背表面上形成背面电极。 Further, the back surface electrode may be formed on the back surface of the semiconductor layer. 背面电极可以包含导电材料例如金属银、镍、铜、铝、钛、钯、铬、钥或者这些材料的任何实用的组合。 The back surface electrode may comprise a conductive metal material such as silver, nickel, copper, aluminum, titanium, palladium, chromium, key or any practical combination of these materials. 光伏器件的可选结构基本上由三种半导体材料构成，并且将被称作“pin器件”。 Alternatively structure  The photovoltaic device essentially consists of three semiconductor material, and will be referred to as "pin devices." “i”代表“本征”并且表示这样的半导体材料，即，在平衡时，这种半导体材料具有相对低数量的任一带电类型的带电载流子，或者在这种半导体材料中的载流子的净数量小于大约5X IO-14CnT3，其中，“净”为p型带电载流子的浓度减去n型载流子的浓度的差的绝对值。 "I" stands for "intrinsic" and refers to a semiconductor material, i.e., at equilibrium, such a semiconductor material having a relatively low number of any one type of charged charge carriers, or in carriers such semiconductor material sub-net quantity is less than about 5X IO-14CnT3, wherein the "net" for the concentration of the p-type charge carrier concentration by subtracting an absolute value of the difference between the n-type carriers. 通常，“i”层的主要功能是吸收光量子并且将光量子转换为电子-空穴对。 Typically, the primary function of "i" layer is absorbed photons and converts the photons to electron - hole pairs. 光产生的电子和空穴在“ i ”层内因漂移和扩散的驱动而运动，直到电子和空穴在i层内或者在P_i界面处或者在i_n界面处彼此“复合”，或者直到电子和空穴分别被n层和p层收集。 Light generating electrons and holes in the "i" internal layer of the drift and diffusion driven movement until electrons and holes in the i-layer or at the interface P_i i_n interface or another "composite", or until the electrons and points are collected n-layer and p-layer. 在pn和pin两种结构中，光产生的带电载流子的复合可以为降低光伏器件的功率转换效率的损耗机制。  pn and pin in two structures, a composite charge carriers generated by light may reduce the power conversion efficiency of the photovoltaic device loss mechanisms. 界面处的复合会受到以下因素的影响，这些因素包括界面处的能级的类型和浓度、界面两侧上的电场以及界面处价带或导带中的任何不连续性。 At the interface of the composite will be influenced by these factors at the level of the interface type and concentration of the electric field on both sides of the valence band at the interface and the interface, or any discontinuity in the conduction band. 因此，半导体之间的界面以及金属与半导体之间的界面对器件性能有明显的影响。 Thus, the interface between the metal and an interface between the semiconductor and the semiconductor has a significant effect on device performance. 消除界面对器件性能的负面影响的方法包括：选择异质结配对（partner),以将两种材料之间的晶格失配最小化；将材料组分分级为ー种异质结材料和另ー种异质结材料；以及用氧、硫、氢或者其它材料使界面“钝化”，从而缚牢中间隙能态的悬挂键。 Method eliminate the negative effects on device performance interface comprises: selecting a heterojunction pairs (partner), to the lattice mismatch between the two materials is minimized; the material components graded heterostructure ー species and otherー species heterojunction material; with an oxygen, sulfur, hydrogen, or other materials to make the interface "passive", so that the dangling bonds firmly tied gap energy state. 另外，研究人员已经在界面处使用两性分子，从而通过在表面上或者在界面处产生偶极层来改变电学性能。 In addition, researchers have used the amphiphilic molecules at the interface, thereby changing the electrical properties generated by the dipole layer or at the interface on the surface. 此外，在不存在晶格失配的情况下，由于在电学性质不同的两种材料之间存在界面而能够容易使晶格的对称性变形，从而由于在异质结配对的原子之间的化学键的本质上的差异而在界面处形成偶极层。 Further, in the absence of lattice mismatch, since there is an interface between two materials of different electrical properties can be easily modified to make the symmetry of the crystal lattice, whereby due to the chemical bonds between atoms in the heterojunction pairs differences in the nature of the dipole layer is formed at the interface. 尽管研究人员已经意识到界面对器件性能的影响，并且已经采用广泛的尝试以及具体的方案来減少界面对器件性能的影响，但是现有技术没有解决界面层对所采用的半导体材料的本征缺陷化学和非本征缺陷化学的稳态化学势的影响。 Although researchers have realized the impact on device performance interface, and attempts have been widely adopted and the specific program interface to reduce the impact on the device performance, but the prior art does not solve the intrinsic defects of the interfacial layer of the semiconductor material used Effect of chemical steady-state chemical potential chemical and extrinsic defects. 因此，在光照和偏置条件下，在与界面邻近的半导体区域以及包括界面的半导体区域内缺少受控电化学势的情况下，在通过单独改变界面状态而实现减轻或者消除影响的区域内会产生本征缺陷和非本征缺陷。 Thus within, and offset in the light conditions, in the absence of a controlled electrochemical potential within the interface with the neighboring semiconductor region and the semiconductor region comprises an interface, by changing the interface state is achieved individually reduce or eliminate the influence of the region will and intrinsic defects generated extrinsic defects. 要求保护的器件不仅解决了界面对器件性能的影响，而且提供了具体的和创新的器件结构，所述器件结构表现出在光照和偏置的稳态条件下对化学势的控制，从而能够使光伏器件表现出改进的功率转换效率。 It claimed not only solve the influence of the interface device on the device performance, but also provides a specific and innovative device structures, the device structure exhibits a chemical potential control at steady state conditions and the offset of the light, thereby enabling the photovoltaic device exhibits an improved power conversion efficiency. 在CdTe基PV器件的一个示例中，采用CdTe的整流结和低电阻结可以包括被设计成改进器件的电学性能的薄膜界面层。  In one example, CdTe-based PV devices, the rectifying junction and a low resistance using CdTe junctions may be designed to include improved electrical performance of the thin film device layer interface. 例如，界面层包括位于MIS器件的CdTe和金属电极之间的氧化物，以及位于CdTe金属电极界面处的Te或者富含Te的化合物（例如，Cu2_xTe、Cu2_x0和Sb2Te3)。 For example, the interface between the CdTe layer comprising an oxide and a metal electrode located MIS device, Te and CdTe located at the interface of the metal electrode or a Te-rich compounds (e.g., Cu2_xTe, Cu2_x0 and Sb2Te3). 界面层可以是通常通过湿化学、溅射蚀刻和溅射沉积、电子束蒸镀然后热退火、化学浴沉积或者原子层沉积方法制造的缓冲层，例如，Marika Edoff atUppsala Universitysee “CIGS Thin Film Solar Cells, Uppsala University FinalReport, Project no. 22213-1 Swedish Energy Agency, Project leader ：Markia Edoff,Period2005-01-01-2006-06-30” 中描述了以上方法。 The interfacial layer may be deposited and then thermally annealed typically, the buffer layer chemical bath deposition or atomic layer deposition method for producing by wet chemical, sputter etching and sputter deposition, electron beam, e.g., Marika Edoff atUppsala Universitysee "CIGS Thin Film Solar Cells , Uppsala University FinalReport, Project no 22213-1 Swedish Energy Agency, Project leader:. Markia Edoff, Period2005-01-01-2006-06-30 "method described above. 最先进的CdTe PV器件采用CdS作为CdTe的宽带隙的n型异质结配对。  The most advanced devices using CdTe PV heterojunction CdS n as a pair of wide bandgap of CdTe. CdS具有2. 42eV的光学带隙，这种带隙小得能够使太阳光照的所有光谱进入CdTe，并且在CdS中产生的空穴不被CdTe收集。 Has an optical band gap of CdS 2. 42eV, which have a small band gap can be made to enter all the spectra of sunlight CdTe, CdS and holes generated are not collected in the CdTe. 厚的CdS层吸收等于大约6mA/cm2的光子，该范围在能够被CdTe吸收的大约30mA/cm2的范围之外。 Thick CdS layer absorbs photons is equal to about 6mA / cm2, and outside of this range can be absorbed in the CdTe is about 30mA / cm2 of. 因此，最先进的CdTe PV器件试图通过采用薄的CdS将这种电流损失最小化，其中，薄的CdS使能量在CdS带隙以上的光的大部分通过。 Thus, the most advanced attempt CdTe PV devices using such a thin CdS current loss is minimized, wherein the thin CdS energy band gap than the majority of the light through the CdS. CdS厚度的下限已经归因于异质结配对需要包含足够的电荷来平衡CdTe中的负的空间电荷。 The lower limit of the thickness of the CdS heterojunction has been attributed to the need to include paired sufficient charge to balance the negative space charge in CdTe. 因此，CdTe的最先进的n型结包含位于CdS的与CdTe相対的一侧上的第二高电阻率的n型“缓冲层”。 Thus, CdTe most advanced n-type junction comprising an n-type "buffer layer" second high-resistivity on the side located on the CdTe Dui phase of CdS. 可以用可以包含掺杂的或未掺杂的透明氧化物例如Sn02、Si02、Sn02:Cd、Sn02:Zn或CdZnO2的高电阻率的缓冲层来覆盖n型的CdS。 May be used may comprise doped or undoped transparent oxide e.g. Sn02, Si02, Sn02: Cd, Sn02: Zn or CdZnO2 buffer layer to cover the high resistivity n-type CdS. 高电阻率缓冲层被认为添加了正的空间电荷并且通过CdS膜消除了分流（shunt)的影响。 High resistivity buffer layer is believed that the addition of positive space charge and the CdS film by eliminating the influence of the shunt (Shunt) a. 大量工作已经针对向高电阻率的“缓冲”层。 A lot of work has been directed to the layer of high resistivity "buffer." 例如，在第5，279，678号美国专利中描述了这种缓冲层，该美国专利通过引用被包含于此。 For example, in U.S. Patent No. 5,279,678 describes such a buffer layer, and the U.S. Patent are incorporated herein by reference. 在任何情况下，以前的CMTe光伏器件考虑将CdS作为在pn结器件中与CMTe形成pn结的n型材料，或者作为在pin器件例如CdS/CdTe/ZnTe结构中的n型材料，例如，CdTe作为本征层，ZnTe作为p型层。 In any case, the previous CMTe photovoltaic device considered CdS as the n-type material a pn junction with CMTe formed at the pn junction device, or as a pin devices e.g. CdS / CdTe / ZnTe structure of the n-type material, e.g., CdTe as the intrinsic layer, ZnTe as a p-type layer. 大量工作已经被针对能够将来自CdTe的空穴进行低损耗传输的CdTe。  CdTe lot of work has been carried out for the low-loss transmission is possible from the hole of CdTe. 理论上，低损耗空穴传输可以利用功函数与CdTe的功函数类似的金属或者利用功函数与CdTe的功函数类似的半导体来实现，另外，所述半导体的价带顶相对靠近CdTe的价带。 Theoretically, a hole transport low-loss may be utilized with a work function of CdTe similar metal or with a work function similar to the work function of CdTe semiconductor achieved, Further, the valence band of the semiconductor is relatively close to the valence band of CdTe . CdTe的价带顶(VBM)是大约5. 74eV，低于真空能级，然而，现在没有已知的金属具有这种高功函数。 CdTe of the valence band (the VBM) is about 5. 74eV, below the vacuum level, however, there is no known metal having such a high work function. 为了减小可用金属的相对低的功函数的影响，研究人员已经采用了半导体层和背面金属接触层之间的界面层，意图通过遂穿进入金属电极中使空穴能够传输。 To reduce the effect of metal available for a relatively low work function, researchers have adopted the interface layer between the semiconductor layer and the back metal contact layer intended can be transmitted by tunneling into the metal electrode manipulation hole. 以前通常意图通过用p型掺杂剂，例如，铜、锑、汞或砷或者采用各种化学方法或物理方法来重掺杂金属电极附近的区域来处理CdTe的表面，从而在界面附近产生富Te区域。  previously generally intended by treatment with p-type dopant, e.g., copper, antimony, arsenic, or mercury or various chemical or physical methods to reset the electrode region near the metal surface treatment doping CdTe, whereby the interface Te-rich region near the produce. 可选地，研究人员已经采用高度掺杂的或者简并的p型半导体例如Cu2_xTe、Cu2_x0、HgTe或Sb2Te3来意图在CMTe和金属电极之间产生隧道结。 Alternatively, researchers have adopted a highly doped or degenerate p-type semiconductors such Cu2_xTe, Cu2_x0, HgTe or Sb2Te3 intended to generate a tunnel junction between the metal electrode and CMTe. 可选地,研究人员已经采用ZnTe作为接触件CdTe的低损耗空穴传输。 Alternatively, researchers have adopted a low-loss ZnTe contact hole transporting of CdTe. 例如，參见第4，710，589号美国专利和第5，909，632号美国专利，这两项美国专利通过引用被包含于此。 For example, see U.S. Pat. No. 4,710,589 and U.S. Pat. No. 5,909,632, both U.S. patents are incorporated herein by reference. ZnTe可以为价带顶与CdTe的价带顶紧密匹配的相对宽带隙的半导体。 CdTe and ZnTe can with the top of the valence band maximum is relatively closely matched wide bandgap semiconductor. 理论上，ZnTe具有附加的优点，即，CdTe和ZnTe之间的导带中的正阶梯将作为趋于从CdTe运动到ZnTe中的电子的电子反射器。 Theoretically, ZnTe has the additional advantage, i.e., positive step between the conduction band of ZnTe and CdTe as reflected electrons tend to ZnTe from CdTe motion of electrons. 在一个示例中，未掺杂的ZnTe膜可以放置为邻近CdTe层，第二简并掺杂铜的ZnTe膜可以放置在未掺杂的ZnTe膜的相对侧。 In one example, the undoped ZnTe film may be placed adjacent the CdTe layer, and a second degenerate copper doped ZnTe film may be placed on opposite sides of the undoped ZnTe films. 采用前面的方法，不清楚将CdTe膜和ZnTe膜的VBM进行匹配起到什么作用，以及铜掺杂剂起到什么作用。 Using the previous method, the clear film and a ZnTe film VBM CdTe matches what kind of role, and a copper dopant play any role. 在任何情况下，使用ZnTe都不会提高采用如上所述其它接触的器件的光伏功率转换效率。 In any case, the use of ZnTe device as described above will not enhance the use of the other contact photovoltaic power conversion efficiency. 两性分子也可以用在界面处，从而通过在表面上或者在界面处产生偶极层来改变半导体器件的电学性能。  The amphiphilic molecule may also be used at the interface, thereby changing the electrical properties of the semiconductor device by generating or dipole layer at the interface on the surface. 例如，參见H. Haick、M. Avbrico、T. Ligonzo、R. Tung和D. Cahen于2006年第128期在美国化学会杂志的6854页-6869页的“Controlling Semioconductor/Metal Junction Barriers by Incomplete, NonidealMoiecular Monolayers，，（通过不完全的、非理想的分子单层来控制半导体/金属结势垒）以及David Cahen和共同作者G. Ashkenasy> D. Cahen> R. Cohen、A. Shanzer 和A. Vilan 于2002 年第35 期在化学研究评述的121 页-128 页的“Molecular Engineering of Semiconductor Surfaces andDevices” (半导体表面和器件的分子工程）。 For example, see H. Haick, M. Avbrico, T. Ligonzo, R. Tung and D. Cahen in 2006 128 Metal Junction Barriers by the "Controlling Semioconductor / 6854 page -6869 page of the Journal of the American Chemical Society Incomplete , NonidealMoiecular monolayers ,, (through incomplete molecular monolayer to a non-ideal control of the semiconductor / metal junction barrier) and co-author David Cahen and G. Ashkenasy> D. Cahen> R. Cohen, a. Shanzer A. and Vilan in 2002 of 35 121 -128 pages in chemical research reviewed in "molecular Engineering of semiconductor surfaces andDevices" (semiconductor surface molecular engineering and devices). 应当注意，即使在不存在晶格失配的情况下，由于在电学性质不同的两种材料之间存在界面，所以可以使晶格的対称性变形，从而由于在异质结配对的原子之间的化学键的本质上差异而导致在界面处形成偶极层。  It should be noted that, even in the absence of lattice mismatch, since there is an interface between two materials of different electrical properties, it can be said that the deformation of the lattice Dui, since such heterojunction pairs the difference between the nature of chemical bonds and atoms results in the formation dipole layer at the interface. 以前的方法不包括使用高功函数的p型TCO来处理半导体层，部分是由于难以生产具有足够高导电性和透光性以起到与n型TCO在其它半导体器件中所起的作用相当的作用的P型TC0。  The previous method does not comprise a p-type TCO high work function to process a semiconductor layer, partly due to the difficulty in producing a sufficiently high electrical conductivity and light transmittance to function as an n-type TCO and the other semiconductor devices plays P-type TC0 effect comparable effect. 因此，第一半导体层和第二半导体层之间、或者半导体层和金属层之间的界面对器件性能有明显的影响。  Thus, between the first semiconductor layer and the second semiconductor layer, or the interface between the semiconductor layer and the metal layer has a significant impact on device performance. 此外，具有半导体层，例如包括CdTe的半导体层的整流结和低电阻率结可以包括被设计为改进器件的电学性能的薄膜界面层。 In addition, a semiconductor layer, for example comprising rectifying junction CdTe semiconductor layer and a low resistivity layer interface junction may include a thin film is designed to improve the electrical performance of the device. 可以通过湿化学、溅射蚀刻和溅射沉积、电子束蒸镀然后热退火、化学浴沉积或者原子层沉积方法来沉积界面层。 By wet chemical, sputter etching and sputter deposition, electron beam evaporation and thermal annealing, chemical bath deposition or atomic layer deposition method for depositing the interfacial layer. 改进的光伏器件可以包括解决在半导体层（例如，CdTe层）与高功函数或宽带隙半导体之间的界面处的半导体（例如，Cd)的化学势的界面层。  improved photovoltaic device may include a semiconductor layer in a solution (e.g., CdTe layer) at the interface between the semiconductor and the high work function or a wide bandgap semiconductor (e.g., Cd) chemical potential of the interfacial layer. 而以前的器件具体地意图通过重掺杂或者通过降低Cd的化学势来诱导P型电极附近的P+区域或者空穴收集体，改进的光伏器件可以具体地将半导体（例如，Cd)的高化学势保持为使得Cd空位的形成和它们的相关缺陷复杂性最小化。 Specifically, while the previous devices intended to induce or by a heavily doped P + region or a hole collecting electrode is close to the P-type Cd by reducing the chemical potential, the photovoltaic device can be improved particularly a semiconductor (e.g., Cd) high chemical such potential holding Cd vacancies and their associated defect formed minimize the complexity. 要求保护的器件通过采用界面改性以及将界面处和界面附近的稳态电化学势控制在适于实现高功率转换效率的光伏器件的能级来改进界面处的电学性质。 By using the claimed device and the interface modifier and a steady state electrochemical potentials at the interface vicinity of the interface level control is adapted to realize a high power conversion efficiency of photovoltaic devices to improve electrical properties at the interface. 通常，pn光伏器件包括基底上的透明导电层、包括宽带隙半导体的第一半导体层、第二半导体层和与第二半导体层接触的界面层，其中，界面层将第二半导体层的化学势保持在受控级。  Generally, PN photovoltaic device comprising a transparent conductive layer on a substrate, comprising a first semiconductor layer of a wide bandgap semiconductor, the second semiconductor layer and the interface layer in contact with the second semiconductor layer, wherein the interfacial layer of the second semiconductor layer the chemical potential is maintained at a controlled level. 界面层可以位于第二半导体层和背面金属接触之间。  The interfacial layer may be positioned between the second semiconductor layer and the back metal contact. 第一宽带隙半导体可以为CdS、SnO2, CdO、ZnO、ZnSe, GaN、In2O3> CdSnO4, ZnS 或CdZnS，所述半导体可以为纯的或者用选择的元素掺杂以实现优化的电学性质或光学性质。 A first wide bandgap semiconductor may be CdS, SnO2, CdO, ZnO, ZnSe, GaN, In2O3> CdSnO4, ZnS or CdZnS, the semiconductor may be a pure or doped with an element selected to optimize the electrical properties or optical properties . 界面层可以为包括宽带隙半导体的第三半导体层。 The interfacial layer may include a third semiconductor layer of a wide bandgap semiconductor. 界面层可以为ZnTe、CdZnTe, CuAlS2, CuAlSe2, CuAlTe2, CuAlO2, CuGaO2 或CuInO2,这些半导体中的任何ー种可以被掺杂或者未被掺杂。 Interface layer may ZnTe, CdZnTe, CuAlS2, CuAlSe2, CuAlTe2, CuAlO2, CuGaO2 or CuInO2, any of these semiconductor ー species may be doped or undoped. 关于CdTe光伏器件中的界面，例如，Te容易与大多数金属M键合形成M-Te键，M-Te键从而可以减少可用来形成Cd-Te键的电子。  CdTe photovoltaic devices on the interface, e.g., Te with most easily bonded to the metal M forming M-Te bond, M-Te bond can be reduced CdTe used to form an electronic key. 因此，在CdTe-金属界面附近的“弱键合的” Cd原子向着CdTe层的表面运动，并且作为将费米能级固定在位于价带顶以上大约IeV的施主。 Accordingly, near the interface of the metal CdTe- "weakly bonded" motion of Cd atoms toward the surface of the CdTe layer, and as the Fermi level is fixed above the top of the valence band is located about IeV donor. 为了有助于CdTe键合地将M-Te键合最小化，本领域技术人员可以在空穴收集体界面附近P型重掺杂CdTe。 In order to facilitate bonding to the CdTe M-Te bond is minimized, the person skilled in the vicinity of CdTe can be a heavily doped P-type collective receiving hole interface. 按照这种方式，可以采用V族元素（例如，N、P、As或Sb)来形成Cd键，这些元素可以用作体（bulk)CdTe中的p型掺杂剂。 In this manner, a group V element may be employed (e.g., N, P, As or Sb) formed Cd bond, these elements can be used as p-type dopant in CdTe body (bulk). 用N或者其它V族元素掺杂CdTe界面是产生重掺杂（即，P+)的、与CdTe层邻近的界面层的物理极限，但是界面掺杂本身不足以确保稳定的高功率转换效率。 N-doped CdTe or interface with other group V elements is to produce a heavily doped (i.e., P +), and the physical limits of the interface layer adjacent the CdTe layer, but the interface itself is not sufficient to ensure stable doping of high power conversion efficiency. 如从本说明书中可知，考虑界面掺杂对界面附近的半导体材料的缺陷化学的影响也是必要的。 As is apparent from the present specification, considering defects of chemical doping on the interface of the semiconductor material in the vicinity of an interface it is necessary. 作为功率转换器件，光伏器件在与平衡条件相反的光照和偏置的稳态条件下进行操作，因此用于产生稳定的、高功率转换效率的相关缺陷化学是在区域中发生光照和偏置的条件。 As a power conversion device, a photovoltaic device is operated under steady state conditions the equilibrium condition and offset opposite to the light, and therefore for producing a stable, high power conversion efficiency of light and is chemically related defects occur in the offset region condition. 因此，目标器件的界面层在CdTe层的界面处以及在CdTe界面附近的区域内控制稳态化学势，从而优化光照和偏置条件下的器件性能。 Thus, the interface layer at the interface of the target device in the CdTe layer and the chemical potential in the steady-state control region near the CdTe interface to optimize performance of the device under illumination and bias conditions. 參照图1，光伏器件10可以包括位于基底130上的透明导电层140、包括宽带隙的半导体103的第一半导体层102、第二半导体层100和与第二半导体层接触的界面层160。  Referring to FIG. 1, a photovoltaic device 10 may include a transparent conductive layer on the substrate 130,140, ​​including a first wide bandgap semiconductor layer 102 of the semiconductor 103, the second semiconductor layer 100 and the interface layer in contact with the second semiconductor layer, 160. 界面层可以位于第二半导体层和背面金属接触150之间。 The interface layer may be positioned second semiconductor layer and the metal contact between the back surface 150. 界面层在厚度上可以为亚单层。 Interfacial layer thickness may be a sub-monolayer. 參照图2,用于产生电能的系统200可以包括光伏器件20,光伏器件20具有位于基底230上的透明导电层240、包括宽带隙半导体203的第一半导体层202、第二半导体层200以及与第二半导体层接触的界面层260。 System  Referring to FIG. 2, for generating electrical energy 200 may include a photovoltaic device 20, a photovoltaic device 20 having a transparent conductive layer 240 located on the substrate 230, including a first wide bandgap semiconductor layer 203 of the semiconductor 202, a second semiconductor layer, and the interface layer 200 in contact with the second semiconductor layer 260. 在第二半导体层的界面区域中，界面层可以将第二半导体层的化学势保持在受控级。 In the interface region of the second semiconductor layer, the interface layer may be a chemical potential of the second semiconductor layer is maintained at a controlled level. 界面层可以位于第二半导体层和背面金属接触250之间。 A second semiconductor layer may be an interface layer between the metal contact 250 and back surface. 系统还可以包括连接到透明导电层的第一电极280b和连接到背面金属接触的第二电极280a。 The system may further include a first electrode connected to the transparent conductive layer 280a and the second electrode 280b is connected to the rear metal contact. 參照图3，光伏器件30可以包括位于基底330上的透明导电层340、包括宽带隙半导体303的第一半导体层302、第二半导体层300以及与第二半导体层接触的界面层360。  Referring to FIG 3, the photovoltaic device 30 may include a transparent conductive layer 340 located on the substrate 330, including a first wide bandgap semiconductor layer 303 of the semiconductor 302, the second semiconductor layer 300 and the interface layer 360 in contact with the second semiconductor layer, . 在第二半导体层的界面区域中，界面层可以将第二半导体层的化学势保持在受控级。 In the interface region of the second semiconductor layer, the interface layer may be a chemical potential of the second semiconductor layer is maintained at a controlled level. 光伏器件还可以包括位于第二半导体层上的背面金属接触350。 The photovoltaic device may further include a rear metal contacts on the second semiconductor layer 350. 參照图4，光伏器件40可以包括位于基底430上的透明导电层440、包括宽带隙半导体403的第一半导体层402、第二半导体层400、第一界面层460a、第二界面层406b以及背面金属接触450。  Referring to FIG 4, the photovoltaic device 40 may include a transparent conductive layer on the substrate 430,440, including a first wide bandgap semiconductor layer 403 of the semiconductor 402, the second semiconductor layer 400, a first interface layer 460a, a second interface layer 406b and a back metal contact 450. 第一界面层460a可以与第二半导体层接触，位于第二半导体层和背面金属接触之间。 The first interface layer 460a may be in contact with the second semiconductor layer between the second semiconductor layer and in contact with the back metal. 第二界面层460b可以与第二半导体层接触，位于第二半导体层和第一半导体层之间。 Second interface layer 460b may be in contact with the second semiconductor layer between the second semiconductor layer and the first semiconductor layer. 在第二半导体层的界面区域中，第一界面层和第二界面层可以将第二半导体层的化学势保持在受控级。 In the interface region of the second semiconductor layer, the first interface layer and the second interface layers may be a chemical potential of the second semiconductor layer is maintained at a controlled level. 參照图5A，光伏器件可以包括位于基底530上的透明导电层540、包括宽带隙半导体的第一半导体层501、包括宽带隙半导体的第二半导体层502、包括宽带隙半导体层的第三半导体层503。  Referring to Figure 5A, the photovoltaic device 540 may include a transparent conductive layer located on the substrate 530, a first semiconductor layer 501 comprising a wide bandgap semiconductor, including a second semiconductor layer 502 of a wide bandgap semiconductor, including a first wide bandgap semiconductor layer, three semiconductor layer 503. 第一界面层560a可以与第二半导体层502接触，位于第二半导体层和第三半导体层503之间。 The first interface layer 560a may be in contact with the second semiconductor layer 502, positioned between the second semiconductor layer and the third semiconductor layer 503. 參照图5B，光伏器件可以包括位于基底530上的透明导电层540、包括宽带隙半导体的第一半导体层501、包括宽带隙半导体的第二半导体层502、包括宽带隙半导体层的第三半导体层503。  Referring to Figure 5B, the photovoltaic device 540 may include a transparent conductive layer located on the substrate 530, a first semiconductor layer 501 comprising a wide bandgap semiconductor, including a second semiconductor layer 502 of a wide bandgap semiconductor, including a first wide bandgap semiconductor layer, three semiconductor layer 503. 第一界面层560a可以与第二半导体层502接触，位于第二半导体层和第一半导体层501之间。 The first interface layer 560a may be in contact with the second semiconductor layer 502, positioned between the second semiconductor layer and the first semiconductor layer 501. 參照图5C，光伏器件可以包括位于基底530上的透明导电层540、包括宽带隙半导体的第一半导体层501、包括宽带隙半导体的第二半导体层502以及包括宽带隙半导体层的第三半导体层503。  Referring to Figure 5C, the photovoltaic device 540 may include a transparent conductive layer located on the substrate 530, a first semiconductor layer 501 comprising a wide bandgap semiconductor, including a first 502 and a wide bandgap semiconductor layer comprising a second semiconductor layer of a wide bandgap semiconductor three semiconductor layer 503. 第一界面层560a可以接触第二半导体层502，位于第二半导体层和第三半导体层503之间。 The first interface layer 560a may contact the second semiconductor layer 502, positioned between the second semiconductor layer and the third semiconductor layer 503. 另ー界面层560b可以接触第二半导体层502，位于第二半导体层和第一半导体层501之间。 Another ー interfacial layer 560b may contact the second semiconductor layer 502, positioned between the second semiconductor layer and the first semiconductor layer 501. 第一半导体层可以包括宽带隙半导体。  The first semiconductor layer may comprise a wide bandgap semiconductor. 宽带隙半导体具有大于2. 4eV的带隙，并且例如可以为n 型半导体，例如，0(15、51102、0(10、2110、21156、63队111203、0(151104、2113 或CdZnS。宽带隙半导体可以被选择为在CdTe的导带底和宽带隙半导体的导带底之间具有最小的或者轻微的正偏移。 Wide band gap semiconductor having a band gap larger than 2. 4eV, and may be, for example, n-type semiconductor, for example, 0 (15,51102,0 (10,2110,21156,63 team 111203,0 (151104,2113 or CdZnS. Wide bandgap the semiconductor may be selected to have minimal or slight positive offset between the conduction band and the conduction band of CdTe wide band gap semiconductor. 界面层可以位于半导体层和背面金属接触之间。  The interfacial layer may be located between the semiconductor layer and the back metal contact. 界面层可以包括GeTe、CdTe:P,CdTe:N、NiAs 或NbP。 The interfacial layer may include GeTe, CdTe: P, CdTe: N, NiAs or NbP. 界面层可以包含p 型半导体例如ZnTe、CdZnTe, CuAlS2' CuAlSe2'CuAlTe2、CuA102、CuGa02或Culn02。 The interfacial layer may include a p-type semiconductor, for example, ZnTe, CdZnTe, CuAlS2 'CuAlSe2'CuAlTe2, CuA102, CuGa02 or Culn02. 更通常地，界面层可以为具有化学式ABO2的材料，其中，A 是Cu、Ag、Au、Pt 或Pd, B 是三价金属离子Al、In、Cr、Co、Fe、Ga、Ti、Co、Ni、Cs、Rh、Sn、Y、La、Pr、Nd、Sm或Eu或者它们的掺杂组成物中的ー种。 More generally, the interface layer may be a material having the formula ABO2 wherein, A is Cu, Ag, Au, Pt or Pd, B is a trivalent metal ions Al, In, Cr, Co, Fe, Ga, Ti, Co, ni, Cs, Rh, Sn, Y, La, ー species Pr, Nd, Sm or Eu or the composition thereof of the dopant. 可选地，界面层可以具有化学组成CuAlX2或者它们的掺杂组成物，其中，X是O、S、Se或Te。 Alternatively, the interfacial layer may have a chemical composition CuAlX2 dopant or composition thereof, wherein, X is O, S, Se or Te. 在界面处以及与界面邻近的区域中，界面层可以在光照和偏置的稳态条件下将镉的化学势保持在受控级。 At an interface and a region adjacent to the interface, the interface layer may be cadmium chemical potential level is maintained at a controlled and steady state conditions in the light bias. 第二半导体层可以包含镉。  The second semiconductor layer may include cadmium. 第二半导体层可以包含CdTe。 The second semiconductor layer may comprise CdTe. 第二半导体层的厚度可以为2微米或者更薄。 The thickness of the second semiconductor layer may be 2 microns or less. 第二半导体层的厚度可以为I微米或者更薄。 The thickness of the second semiconductor layer may be I m or thinner. 第一半导体层可以包括III-V族化合物或者它们的合金。  The first semiconductor layer may include group III-V compound or an alloy thereof. III-V族化合物可以为具有化学式XY的材料，其中，X选自于包括硼、铝、镓、铟和铊的组，Y选自于包括氮、磷、神、锑和铋的组。 Group III-V compound may be a material having the formula XY, wherein, X is selected to include boron, aluminum, gallium, indium, and thallium group, Y is selected to include nitrogen, phosphorus, God, antimony and bismuth groups. 例如，III-V族化合物可以为镓氮化物。 For example, III-V group compound may be a gallium nitride. 镓氮化物可以为氮化镓铝。 Gallium nitride may be aluminum gallium nitride. 第二半导体层可以包含II-VI族化合物或者它们的合金。  The second semiconductor layer may include group II-VI compounds or alloys thereof. II-VI族化合物可以为具有化学式X' Y'的材料，其中，X'选自于包括锌、镉、镁、锰和汞的组，Y'选自于包括氧、硫、硒、碲和钋的组。 Group II-VI compound may be a material having the formula X 'Y', wherein, X 'is selected from the group consisting of zinc, cadmium, magnesium, manganese and mercury, Y' selected from the group comprising oxygen, sulfur, selenium, tellurium, and polonium group. 例如，II-VI族化合物可以为镉碲化物。 For example, II-VI compound cadmium telluride may be. 异质结可以形成在II-VI族化合物与III-V族化合物之间。  The heterojunction may be formed between the Group II-VI compounds and Group III-V compound. 界面层可以形成整流结，例如，位于II-VI族化合物与III-V族化合物之间的整流异质结。 A rectifying junction interface layer may be formed, for example, is located between the rectifying heterojunction Group II-VI compounds and Group III-V compound. 界面层可以包括氧化物或者它们的掺杂的组合物。  The interfacial layer may comprise an oxide or doped compositions thereof. 例如，氧化物可以为氧化锌。 For example, oxide may be zinc oxide. 氧化物可以为氧化汞。 Oxide may be oxidized mercury. 氧化物可以为氧化锡。 Oxide may be tin oxide. 氧化物可以为掺杂的氧化锡。 Oxide may be doped tin oxide. 掺杂的氧化锡可以为掺锌氧化锡。 It may be doped tin oxide-doped zinc tin oxide. 掺杂的氧化锡可以为掺镉氧化锡。 Doped tin oxide may be doped cadmium tin oxide. 氧化物可以为掺杂的氧化锌。 Oxide may be doped zinc oxide. 例如， 氧化物可以为氧化镉锌、氧化铜、氧化铁、氧化镁、氧化镍、氧化钮、氧化银、氧化银、氧化钛、 氧化钒。 For example, cadmium zinc oxide may be an oxide, copper oxide, iron oxide, magnesium oxide, nickel oxide, button, silver oxide, silver oxide, titanium oxide, vanadium oxide. 光伏器件还可以包括连接到透明导电层的第一电极以及连接到背面金属接触的第二电极。  The photovoltaic device may further comprise a first electrode connected to the transparent conductive layer and a second electrode connected to the rear metal contact. 对于能量在IeV和3eV之间的光，第一电极可以基本上透明，对于能量在第二半导体的带隙之下（例如，位于IeV和I. SeV之间）的光，第二电极可以在很大程度上透明。 For the energy of the light and between IeV 3eV, the first electrode may be substantially transparent to the energy below the bandgap of the second semiconductor (e.g., between IeV and I. SeV) light, the second electrode may be largely transparent. 制造光伏器件的方法可以包括：在基底上沉积第一半导体层，第一半导体层包括宽带隙半导体；在第一半导体层上方沉积第二半导体层；沉积与第二半导体层接触的界面层。  The method of manufacturing a photovoltaic device may comprise: depositing a first semiconductor layer on a substrate, a first semiconductor layer comprises a wide bandgap semiconductor; a second semiconductor layer deposited over the first semiconductor layer; depositing a interfacial layer in contact with the second semiconductor Floor. 在第二半导体层的界面区域中，界面层可以将第二半导体层的化学势保持在受控级。 In the interface region of the second semiconductor layer, the interface layer may be a chemical potential of the second semiconductor layer is maintained at a controlled level. 界面层可以位于第二半导体层和背面金属接触之间。 Interfacial layer may be located between the second semiconductor layer and the back metal contact. 界面层可以位于第二半导体层和第一半导体层之间。 Interfacial layer may be located between the second semiconductor layer and the first semiconductor layer. ー种方法可以包括沉积可以保持镉的化学势的界面层。  ー method may include depositing the interface layer may be maintained cadmium chemical potential. 可以通过溅射来沉积界面层。 The interface layer may be deposited by sputtering. 可以通过原子层沉积来沉积界面层。 The interface layer may be deposited by atomic layer deposition. 可以通过选择性的离子层吸收和反应沉积来沉积界面层。 It can be absorbed by an ion selective layer and the interfacial layer is deposited by reactive deposition. 一种用于产生电能的系统可以包括位于基底上的透明导电层、包括宽带隙半导体的第一半导体层、第二半导体层、与第二半导体层接触的界面层。 System  A method for generating electrical energy may include a transparent conductive layer located on a substrate, comprising a first semiconductor layer of a wide bandgap semiconductor, the second semiconductor layer, an interfacial layer in contact with the second semiconductor layer. 在第二半导体层、连接到透明导电层的第一电连接件、连接到背面金属接触的第二电连接件的界面区域中，界面层可以将第二半导体层的化学势保持在受控级。 In the second semiconductor layer, transparent conductive layer connected to the first electrical connection member, connected to the rear metal contact region of the second electrical connector interface, the interface layer may be a chemical potential of the second semiconductor layer is maintained at a controlled level . 界面层可以位于第二半导体层和背面金属接触之间。 Interfacial layer may be located between the second semiconductor layer and the back metal contact. 一种用于产生电能的系统可以包括连接到透明导电层的第一电极和连接到背面金属接触的第二电极。 System  A method for generating electrical energy may include a first electrode connected to the transparent conductive layer and a second electrode connected to the rear metal contact. 对于能量在IeV和3eV之间的光来说，第一电极可以基本上透明；对于能量在第二半导体的带隙之下的光来说，第二电极可以在很大程度上透明。 For the light energy of 3eV and between IeV, the first electrode may be substantially transparent; the energy band gap of light under the second semiconductor, the second electrode may be transparent to a large extent. ー种用于产生电能的系统可以包括串联定位的两个或者两个以上的光伏器件。 The system for generating electrical energy ー species may comprise two or more tandem photovoltaic device positioning. 界面层可以位于半导体层的ー侧上，或者位于半导体层的两侧上。  The interfacial layer may be positioned on the side ー semiconductor layer or located on both sides of the semiconductor layer. 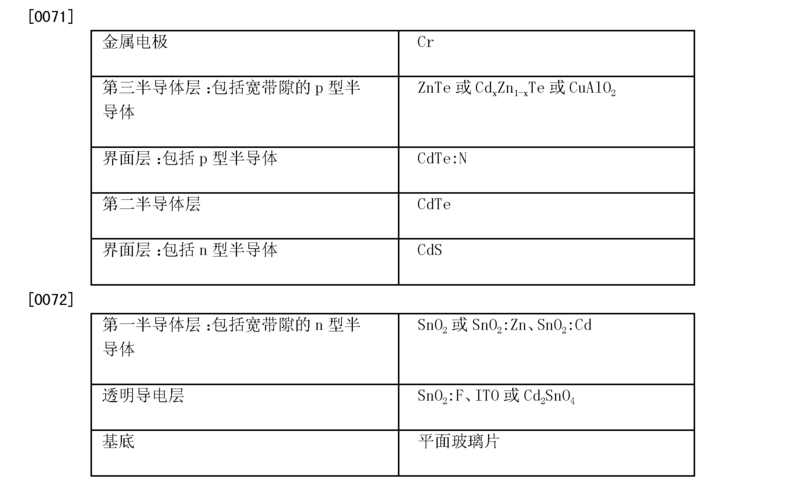 例如，半导体层可以包括CMTe或者CdTe与Zn、Hg、Mn或Mg的合金。 For example, the semiconductor layer may include CMTe or CdTe with Zn, Hg, Mn or Mg alloy. 可以通过利用高功函数的材料或者通过本领域通用的其它已知方式来实现半导体层和金属接触之间或者半导体层和另一半导体之间的低电阻空穴传输。 A low resistance can be achieved between the hole transport layer and another semiconductor or a semiconductor layer between the semiconductor and the metal contact manner by using other known material having a high work function or general purpose in the art. 在第二示例中，光伏器件可以具有与第二半导体层接触的第三半导体层。  In a second example, the photovoltaic device may have a third semiconductor layer in contact with the second semiconductor layer. 光伏电池可以具有多个层。  The photovoltaic cell may have a plurality of layers. 多个层可以包括底层、覆盖层、窗ロ层、吸收层和顶层，其中，底层可以为透明导电层。 A plurality of layers may include a bottom layer, a window layer overlying ro, the absorbent layer and a top layer, wherein the bottom layer may be a transparent conductive layer. 可以根据需要在每个沉积位置用単独的沉积气体供应和真空密封的沉积室在生产线上的不同沉积位置来沉积每个层。 The deposition may be needed at each location with the deposition chamber a deposition gas supply and vacuum-sealed radiolabeling separate production line at different deposition positions of each of the layers deposited. 可以通过滚动传送器将基底从一个沉积位置传送到另ー个沉积位置，直到沉积完所有期望的层。 The substrate may be passed through the rolling conveyer from one deposition position to another position ー sedimentary, until all of the desired deposited layer finish. 可以采用其它技术例如溅射来添加其它的层。 Other techniques such as sputtering may be used to add additional layers. 电导体可以分别连接到顶层和底层，以收集当太阳能入射到吸收层上时产生的电能。 Electrical conductors may be connected to the top and bottom, to collect the electrical energy generated when the solar energy incident on the absorption layer. 顶基底层可以放置在顶层的顶部上，从而形成夹心结构并且完成光伏电池。 The top substrate layer may be placed on top of the top layer to form a sandwich structure and complete the photovoltaic cell. 底层可以为透明导电层，并且可以为例如透明导电氧化物，所述透明导电氧化物例如为氧化锡或者用氟掺杂的氧化錫。  The bottom layer may be a transparent conductive layer, and may be, for example, a transparent conductive oxide, for example, the transparent conductive oxide is tin oxide or tin oxide doped with fluorine. 光伏电池的底层可以为透明导电层。 The bottom layer  The photovoltaic cell may be a transparent conductive layer. 薄的覆盖层可以位于透明导电层的顶部上并且至少部分地覆盖透明导电层。 Thin covering layer may be positioned on top of the transparent conductive layer and at least partially covers the transparent conductive layer. 沉积的下ー层可以为第一导电层，第一导电层可以作为窗ロ层并且可以根据透明导电层和覆盖层的使用而较薄。ー lower layer may be deposited a first conductive layer, a first conductive layer as a window layer and ro may be used according to the thin conductive layer and transparent cover layer. 沉积的下ー层可以为第二半导体层，第二半导体层作为吸收层。ー lower layer may be deposited a second semiconductor layer, a second semiconductor layer as the absorber layer. 可以沉积其它层，例如，包括掺杂剂的层，或者可以将其它层根据需要通过制造エ艺放置在基底上。 Other layers may be deposited, for example, comprises a dopant layer, or another layer may be disposed on the substrate as required by the production Ester arts. 导致在第二半导体层和第一接触之间形成分流，从而导致在针孔周围的局部区域上形成漏端。 Resulting in formation of split between the first contact and the second semiconductor layer, forming a drain leading end in the local region surrounding the pinhole. 这种路径的电阻的轻微增加可以急剧地減少分流所影响的区域。 This slight increase in the resistance path can drastically reduce the impact of the diversion area. 第一半导体层可以作为第二半导体层的窗ロ层。  The first semiconductor layer may be used as a window layer of the second semiconductor layer ro. 第一半导体层可以比第二半导体层薄。 The first semiconductor layer may be thinner than the second semiconductor. 由于第一半导体层比第二半导体层薄，所以第一半导体层可以允许更短波长的入射光更大程度地透射到第二半导体层。 Since the first semiconductor layer is thinner than the second semiconductor, the first semiconductor layer may allow a shorter wavelength of the incident light transmits a greater extent to the second semiconductor layer. 已经描述了几个实施例。  Having described several embodiments. 然而，应该理解，在不脱离所要求保护的器件的精神和范围的情况下，可以进行各种修改。 However, it should be understood that, without departing from the spirit and scope of the claimed devices may be variously modified. 例如，半导体层可以包含各种其它材料，比如可以包含用于缓冲层和覆盖层的材料。 For example, the semiconductor layer may contain various other materials, such as may comprise a material for the buffer layer and the cover layer. 因此，其它实施例也在权利要求的范围内。 Accordingly, other embodiments are within the scope of the claims. 1. 一种光伏器件，所述光伏器件包括： 透明导电层，位于基底上方； 第一半导体层，包括宽带隙半导体； 第二半导体层，具有第一表面和第二表面； 第一界面层，与第二半导体层的第一表面接触，所述第一界面层包括与宽带隙半导体的类型相同类型的半导体； 第二界面层，与第二半导体层的第二表面接触，第二界面层包括与第一界面层的类型相反类型的半导体； 背面金属接触， 其中，第一界面层位于第一半导体层和第二半导体层之间，第二界面层位于第二半导体层和背面金属接触之间； 其中，第一界面层和第二界面层将第二半导体层的化学势保持在受控级。 1. A photovoltaic device, the photovoltaic device comprising: a transparent conductive layer disposed over the substrate; a first semiconductor layer, comprising a wide bandgap semiconductor; a second semiconductor layer having a first surface and a second surface; a first interface layer, contacting the first surface of the second semiconductor layer and the first interface layer comprises the same type of semiconductor type with a wide bandgap semiconductor; a second interface layer, a second surface in contact with the second semiconductor layer, a second interface layer comprises the type of the first interface layer of a semiconductor of opposite type; back side metal contact, wherein the first interface layer between the first semiconductor layer and the second semiconductor layer, a second interface layer located on the second semiconductor layer and the back metal contact between ; wherein the first interface layer and second interface layer chemical potential of the second semiconductor layer is maintained at a controlled level. 2.根据权利要求I所述的器件，其中，第二半导体层包含CdTe。 2. The device according to claim I, wherein the second semiconductor layer comprises CdTe. 3.根据权利要求I所述的器件，其中，第二半导体层包括CdTe的合金。 3. Device according to claim I, wherein the second layer comprises a CdTe semiconductor alloys. 4.根据权利要求2所述的器件，其中，第二半导体层包括CdTe合金，其中，Cd至少部分地被Zn、Hg、Mg或Mn代替。 4. The device of claim 2, wherein the second layer comprises a CdTe semiconductor alloy, wherein, Cd least partially Zn, Hg, Mg, or Mn instead. 5.根据权利要求2所述的器件，其中，第二半导体层包括CdTe合金，其中，Te至少部分地被S、Se或O代替。 5. The device according to claim 2, wherein the second layer comprises a CdTe semiconductor alloy, wherein, Te at least partially S, Se or O instead. 6.根据权利要求2所述的器件，其中，所述化学势为Cd的化学势。 6. The device according to claim 2, wherein the chemical potential of the chemical potential is Cd. 7.根据权利要求I所述的器件，其中，第一界面层和第二界面层中的至少一个在第二半导体层的界面区域内将第二半导体层的化学势保持在受控级。 7. The device of claim I, wherein the first interface layer and second interface layer within the interface region of at least a second semiconductor layer of the chemical potential of the second semiconductor layer is maintained at a controlled level. 8.根据权利要求I所述的器件，其中，所述第一界面层和第二界面层中的至少一个为第三半导体层。 8. The device according to claim I, wherein said first interface layer and the second interface layer, at least one of the third semiconductor layer. 9.根据权利要求I所述的器件，其中，用于形成光伏器件的材料包括ZnTe、CdZnTe,CuAlS2, CuAlSe2, CuAlO2, CuGaO2 或CuInO2。 9. The device of claim I, wherein a material for forming a photovoltaic device comprising ZnTe, CdZnTe, CuAlS2, CuAlSe2, CuAlO2, CuGaO2 or CuInO2. 10.根据权利要求I所述的器件，其中，第一界面层和第二界面层中的至少一个的界面材料包括GeTe、CdTe: P、CdTe: N、NiAs 或NbP。 10. The device of claim I, wherein the first interface layer and the second interface layer comprises at least one interface material GeTe, CdTe: P, CdTe: N, NiAs or NbP. 11.根据权利要求2所述的器件，其中，所述第一表面和所述第二表面中的至少一个包括Cd与周期表第五主族的元素之间的化学键。 11. The device of claim 2, wherein the first surface and the second surface comprises at least one chemical bond between Cd and Periodic Table of the elements of the fifth main group. 12.根据权利要求11所述的器件，其中，所述第一表面和所述第二表面中的至少一个包括Cd与N、P、As和Sb之间的化学键。 12. The device according to claim 11, wherein the first surface and the second surface comprises at least one bond between Cd, N, P, As and Sb. 13.根据权利要求I所述的器件，其中，第一半导体层是Sn02、SnO2:Zn、SnO2:Cd、ZnO、ZnSe、GaN、ln203、CdSnO3, ZnS 或CdZnS。 13. The device according to claim I, wherein the first semiconductor layer is Sn02, SnO2: Zn, SnO2: Cd, ZnO, ZnSe, GaN, ln203, CdSnO3, ZnS or CdZnS. 14.根据权利要求I所述的器件，其中，所述第一界面层和所述第二界面层中的至少一个是Cd与包括O、S或Se的硫族元素中的任何一种的化合物。 14. The device according to claim I, wherein said first interface layer and the second interface layer is at least any one of a chalcogen elements include Cd, O, S or Se in the compound is . 15.根据权利要求I所述的器件，其中，所述第一界面层和所述第二界面层中的至少一个包括CdS。 15. The device according to claim I, wherein said first interface layer and the second interface layer comprises at least one of CdS. 16.根据权利要求2所述的器件，其中，所述表面包括Te与周期表第三主族中的任何元素之间的化学键。 16. The device according to claim 2, wherein said surface comprises a periodic table Te bond between any element of the third main group. 17.根据权利要求16所述的器件，其中，所述表面包括Te与B、Al、Ga、In或H之间的化学键。 17. The device according to claim 16, wherein said surface comprises Te and the bond between B, Al, Ga, In, or H.
18.根据权利要求I所述的器件，其中，所述界面层是具有化学式ABO2的材料或者它们的掺杂组成物中的一种，其中，A是Cu、Ag、Au、Pt或Pd，B是三价金属离子Al、In、Cr、Co、Fe、Ga、Ti、Co、Ni、Cs、Rh、Sn、Y、La、Pr、Nd、Sm 或Eu。 18. The device of claim I, wherein the interface layer having a chemical formula ABO2 dopant materials or composition thereof, wherein, A is Cu, Ag, Au, Pt or Pd, B is a trivalent metal ions Al, In, Cr, Co, Fe, Ga, Ti, Co, Ni, Cs, Rh, Sn, Y, La, Pr, Nd, Sm or Eu. 19.根据权利要求I所述的器件，其中，第二半导体层小于2 厚。 19. The device according to claim I, wherein the thickness of the second semiconductor layer is less than 2. 20.根据权利要求I所述的器件，其中，第二半导体层小于Iu m厚。 20. A device according to claim I, wherein the second semiconductor layer is smaller than the Iu m thick. 21. 一种制造光伏器件的方法，所述方法包括以下步骤： 在基底上沉积第一半导体层，第一半导体层包括宽带隙半导体； 在第一半导体层上方沉积第二半导体层，第二半导体层具有第一表面和第二表面；沉积第一界面层，以与第二半导体层的第一表面接触，所述第一界面层包括与宽带隙半导体的类型相同类型的半导体； 沉积第二界面层，以与第二半导体层的第二表面接触，第二界面层包括与第一界面层的类型相反类型的半导体； 沉积背面金属接触； 其中，第一界面层位于第一半导体层和第二半导体层之间，第二界面层位于第二半导体层和背面金属接触之间； 其中，第一界面层和第二界面层将第二半导体层的化学势保持在受控级。 21. A method of manufacturing a photovoltaic device, the method comprising the steps of: depositing a first semiconductor layer on a substrate, a first semiconductor layer comprises a wide bandgap semiconductor; a second semiconductor layer deposited over the first semiconductor layer, a second semiconductor layer having a first surface and a second surface; depositing a first interface layer to a first surface in contact with the second semiconductor layer, the first interface layer comprises the same type as the wide band gap semiconductor is a semiconductor; depositing a second interface layer to a second surface in contact with the second semiconductor layer, a second interface layer comprises a semiconductor type with the opposite type of the first interface layer; depositing a backside metal contact; wherein the first interface layer located between the first and the second semiconductor layer, between the semiconductor layer, a second interface layer located between the second semiconductor layer and the back metal contact; wherein the first interface layer and second interface layer chemical potential of the second semiconductor layer is maintained at a controlled level. 22.根据权利要求21所述的方法，其中，通过溅射来沉积所述界面层。 22. The method according to claim 21, wherein the depositing by sputtering the interfacial layer. 23.根据权利要求21所述的方法，其中，通过原子层沉积来沉积所述界面层。 23. The method according to claim 21, wherein, by atomic layer deposition to deposit the interface layer. 24.根据权利要求21所述的方法，其中，通过选择性离子层吸收和反应沉积来沉积所述界面层。 24. The method according to claim 21, wherein the absorbing layer by selective ion deposition reaction and depositing the interfacial layer. 25. —种用于产生电能的系统,所述系统包括： 透明导电层，位于基底上方； 第一半导体层，包括宽带隙半导体； 第二半导体层，具有第一表面和第二表面； 第一界面层，与第二半导体层的第一表面接触，所述第一界面层包括与宽带隙半导体的类型相同类型的半导体； 第二界面层，与第二半导体层的第二表面接触，第二界面层包括与第一界面层的类型相反类型的半导体； 背面金属接触， 其中，第一界面层位于第一半导体层和第二半导体层之间，第二界面层位于第二半导体层和背面金属接触之间； 其中，第一界面层和第二界面层将第二半导体层的化学势保持在受控级； 第一电连接，连接到所述透明导电层； 第二电连接，连接到背面金属接触。 25. - kind of system for generating electrical energy, the system comprising: a transparent conductive layer disposed over the substrate; a first semiconductor layer, comprising a wide bandgap semiconductor; a second semiconductor layer having a first surface and a second surface; a first interface layer in contact with the first surface of the second semiconductor layer, the first interface layer comprises the same type as the wide bandgap semiconductor with a semiconductor; a second interface layer, a second surface in contact with the second semiconductor layer, a second the interfacial layer comprises a first interface type semiconductor layer of the opposite type; between the back side metal contact, wherein the first interface layer located between the first semiconductor layer and the second semiconductor layer, a second interface layer located on the second semiconductor layer and a back metal between the contact; wherein the first interface layer and second interface layer chemical potential of the second semiconductor layer is maintained at a controlled level; a first electrical connector connected to the transparent conductive layer; a second connector electrically connected to the back metal contact. 26.根据权利要求25所述的系统，其中，用金属电极来代替所述透明导电层，用透明导电层电极来代替背面金属接触。 26. The system according to claim 25, wherein the metal electrode instead of the transparent conductive layer, a transparent conductive layer of the electrode in place of the back metal contact. 27.根据权利要求25所述的系统，还包括连接到所述透明导电层的第一电极和连接到所述背面金属接触的第二电极。 27. The system according to claim 25, further comprising a first electrode connected to the transparent conductive layer and a second electrode connected to the rear metal contact. 28.根据权利要求25所述的系统，其中，用所述透明导电层来代替所述背面金属接触，光伏器件与另一个光伏器件串联使用。 28. The system according to claim 25, wherein the transparent conductive layer used in place of the back side metal contact, photovoltaic device with another photovoltaic devices in series. Morales-Acevedo 2006 Can we improve the record efficiency of CdS/CdTe solar cells?